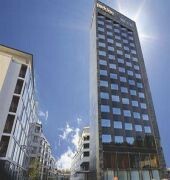 Located in the newly developed Hammarby Sjostad district, this hotel is walking distance from Stockholm's city centre. 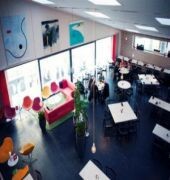 Hammarby ski slope is just around the corner, and Stockholm Globe arenas are a short drive. Situated next to Lake Hammarby and Lake Sickla, this modern Stockholm hotel is nestled among several charming quays and walkways. Guests can enjoy a delicious meal at the casual RBG Bar & Grill or relax at the hotel bar. Five modern meeting rooms and 178 stylish guest rooms await. 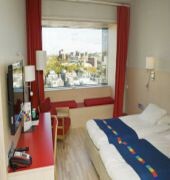 Business Friendly Rooms and a Suite are equipped with Free high-speed, wireless Internet access, a flat-screen television and fitness centre access, making this Stockholm hotel ideal for business and leisure travellers. The hotel is also only 100 metres from tram and bus stations for convenient travel around the city.